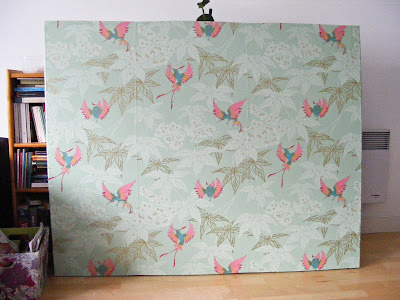 So, canvasses and wallpaper acquired, I telephoned my mother for advice. She knows how to wallpaper things, see. 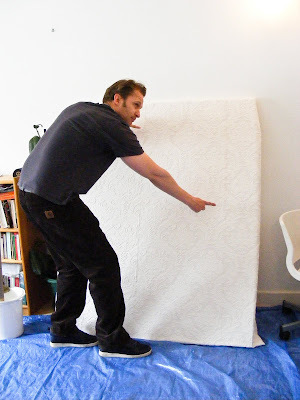 We would have to paint the canvases with a thin layer of wallpaper paste, she said, and leave to dry before then pasting the wallpaper. It's called sizing, apparently. 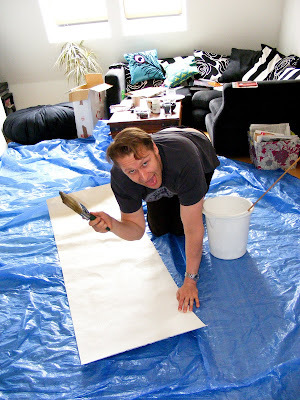 So, we covered the floor with a massive tarpaulin (I knew there would be mess. There's always mess) and got to work. 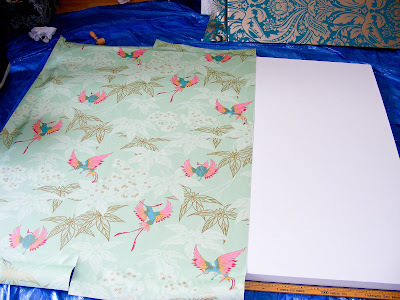 I used Solvite wallpaper adhesive that you have to mix up yourself, divided it into 4 and worked out how much water I needed for the sizing. We mixed the correct quantities (I think - maths not really my area of expertise), but if I were to do this again, I would paint the canvases with a much thicker coat of paste, in order to get the actual canvas part much stiffer than we did. Unhelpfully, I couldn't find any instructions on the adhesive pack or on the interwebs for how long the wallpaper paste would take to dry. 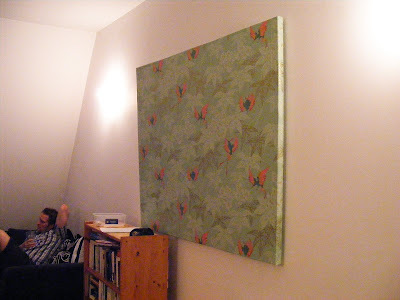 We ended up leaving it overnight, although having left the sized canvasses in a warm room, they were dry in a couple of hours. Anyway, we mixed up the adhesive again and pasted the paper. 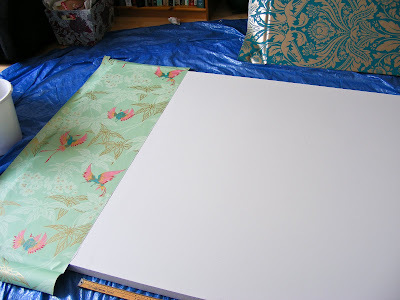 Then plonked it straight onto the canvas, without leaving it to soak into the paper. This was the not following instructions part. Still, it all seemed to go okay until we discovered that the edges were conspiring against us and refusing to stick to the canvas. Attempting to line up the second piece was also tricky. So, basically, our join looked rubbish. See? Second one worked slightly better. More paste under the join seemed to help. Here is my glamorous assistant showing the difference between our first and second joins. Improvement was definitely made. We still had some joining problems. I think the problem is that a wall is nice and solid and you can really press down on the joins, whereas a canvas is a bit more flexible. I was a also a bit worried out getting paste on my lovely shiny paper, so could definitely have used more on the joins. But, it actually looked okay. 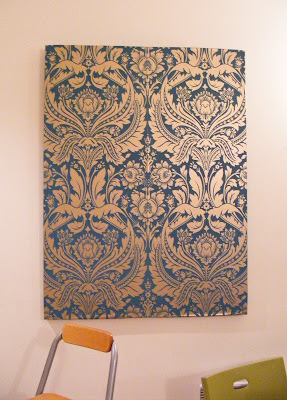 The final (and rather more complicated) canvas was a massive 6' x 4' one, to be hung landscape style and papered with Osborne and Little Grove Garden wallpaper, which I have been obsessing over for some years. Small and brighly coloured hummingbirds! 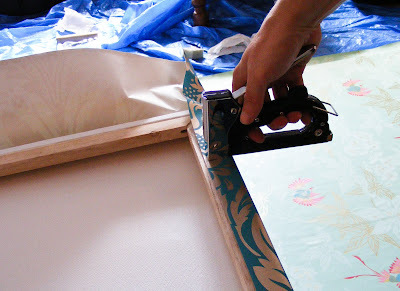 Annoyingly, the canvas was slightly too wide for three drops of paper, so we also had to cut a silly little strip for one end. Bah. 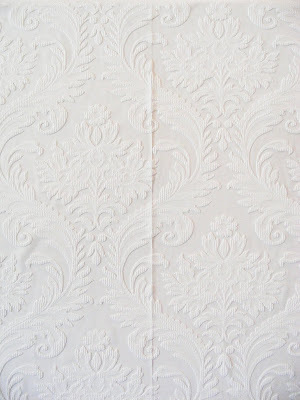 Given what we'd learned so far, we were way more liberal with the wallpaper paste for this one, which made the joins stick much better. The boy found the staple gunning part terribly exciting and went off in search of more things to staple. Had the pictures not already looked a bit on the wonky side, I would have probably cut little v shapes out of the corners and folded them in a mitre joint kind of way. But they were, so I didn't. 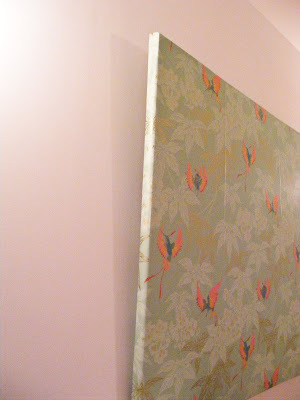 Hung them on the walls and, apart from the horrible warping on the large frame, they actully don't look too awful. They could have been better, but given the slightly cavalier way we approached the project, they could have been much, much worse. 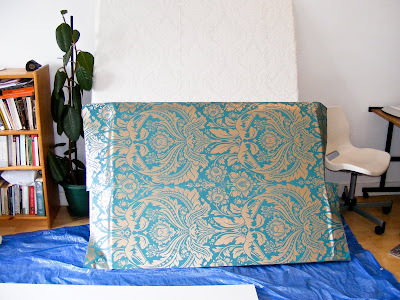 So, if you're thinking of doing something similar, I hope this little post is of some assistance, as despite extensive Googling, I couldn't find any information on wallpapering an artist's canvas, hence the write up.